Learn more about the Lorex Vandal Resistant 1080p High-Definition Security Camera. Get pricing, and answers to common questions. The Lorex Vandal Resistant 1080p High-Definition Security Camera can compete with a camera twice its size. This Lorex security camera provides high-definition picture quality. 90° viewing field for monitoring open areas. Pros: Vandal-resistant. Provides a 90° wide-angle field of view and extensive coverage with a single camera. Cons: Connectors aren't weather resistant. Bottomline: Affordable solution for your growing business: a single camera with the field of view of a range of cameras. What are some alternatives to the Lorex Vandal Resistant 1080p High-Definition Security Camera? Where can I buy the Lorex Vandal Resistant 1080p High-Definition Security Camera? The Lorex Vandal Resistant 1080p High-Definition Security Camera is available via Amazon and the Lorex website. Does the Lorex Vandal Resistant 1080p High-Definition Security Camera work at night? Yes. This camera's infrared (IR) LEDs enable good performance in the dark, with night-vision capabilities of up to 130 ft. in regular nighttime conditions, and up to 90 ft. in complete darkness. SmartIR enables close-up recognition in the dark and ClearNight imaging optimizes recording efficiency, ensuring very clear nighttime footage. Can the Lorex Vandal Resistant 1080p High-Definition Security Camera be used in any weather? Yes. 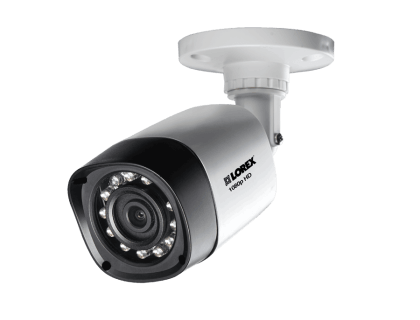 The Lorex Vandal Resistant 1080p High-Definition Security Camera is weatherproof. This IP66-rated camera is resistant to inclement weather, and is designed for North American climates. It can operate in temperatures ranging from -22 °F to 140 °F.